Next weekend: Thought Bubble 2015! Yes; next weekend (14/15 November) a whole bunch of amazing comic folks will be descending on the Royal Armouries in Leeds for two glorious days of fun… & once again I’ll be tagging along too! This will be my third year exhibiting at the convention, & my first in the TB Marquee, which is an exciting new experience. Nice & close to the entrance, & also right along side several of my pals; it will all be excellent fun. At Thought Bubble, I will of course have with me copies of Exit Generation #1 & #2, Find (including some signed by artist Alex Cormack; while stocks last), & a brand new comic called (*drumroll*)… Shorts! It features a gorgeous cover from lead-slinger extraordinaire Ruairí Coleman, who will also be at Thought Bubble (& tabling right behind me! ), so you can get him to sign it all nice too! I also want to say an extra-big thank you to both Dee Cunniffe, for helping me put it all together, & Rich Hardiman at comicprintinguk.com for the always swift & excellent service; both are kings of men, & you should hire Dee for all your colours, & Rich for all your comic printing! This year, I’m also lucky enough to be a small part of the Thought Bubble Anthology from Image Comics, having worked with sensational art talent Abigail Harding & letter-lord Colin Bell on a piece called Across My Heart. The anthology features some some of the best new & established talent out there, including several of my personal favourite writers & artists, so am completely honoured to share a publication with them. It will be in shops this Wednesday, 11 November, so you can grab it before the show. All profits go to the Barnardo’s Childen’s Charity, so I do hope you pick it up (& if you bring it over to Marquee Table 64 on Saturday or Sunday, I’ll happily scribble my name on it for you too)! Well, I better get back to getting ready; hope to see you all at the weekend! Exit Generation #1 – Review Round-Up! It just under a week since Exit Generation #1 hit comic stores, & in that time we’ve been lucky enough to have some really lovely people give the book some really lovely mentions! Before I list the sites, blogs, podcasts & others who were kind enough to review or talk about the comic, I wanted to thank not just everyone who did that, but also anyone who went out & picked up a copy at their local shop, or grabbed it online – you are literally the best! 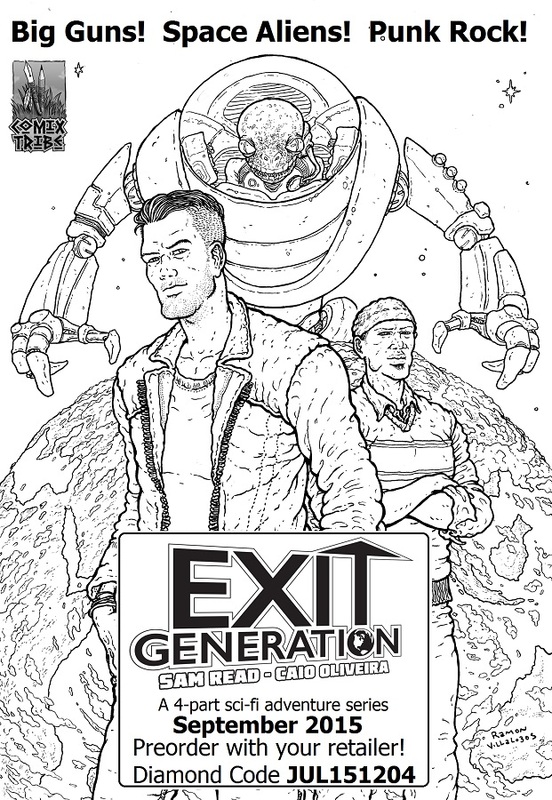 Jeff Marsick on Newsarama gave Exit Generation #1 a whopping 8/10, saying it is “a fun book and a great read by a terrific writer and artist combination” – Thanks so much! Read it all HERE. Stephen on Comicbuzz said it was “a good issue with a lot of further potential for the ongoing series” – You can read the full review HERE. James Blundell for Pipedream Comics awarded the issue 4 out of 5, mentioning“the premise behind the book as well as the beautiful artwork is incentive enough for any reader to give this comic a chance” – I really appreciate that! See the rest of what James said HERE. Aaron Golden of Living Myth Magazine hailed Exit Generation as having “one of the best concepts for a comic, ever” – Wow! Stunned by the compliment! See this among the rest of Aaron’s weekly recommendations HERE. Iñigo Sáenz on Comic Book Invest marked this issue as “absolutely recommended”, & you can find those kind words alongside the rest of CBI’s choices HERE. Brett Schenker of Graphic Policy said Exit Generation sets-up “a fascinating concept that could turn into a hell of an exploration and idea” & gives it a solid 7/10; see the rest Brett’s review HERE. On Spartantown, Enrique Rea says the series “is off to a great start with intriguing characters, an explosive cliffhanger, and fantastic storytelling potential” – thanks! See the full article HERE. Alex J for The Beat named Exit Generation #1 as one of four underdog books to back last week; really grateful for the mention! Check it out alongside the other three HERE. I sat down for a nice email chat with Inter Comics Podcast, which you can read HERE. Need To Consume recapped their coverage of the self-published version of Exit Generation to coincide with the direct market release HERE. Danny Rivera for Comicsverse described the first issue as “a masterful début and a title to which we should all be paying very, very close attention” – Humbling! See the full article HERE. For Mightyville, Joe Katch said Exit Generation “a fresh concept with an interesting Sci-Fi take” & gave #1 both a full review (HERE) & mentioned it in their ‘Number One Bullets’ review column (HERE). Ain’t It Cool News called the issue “one of the best new comics of the year” – Completely blown away by that! See the entire review HERE. Ceej for Big Comic Page says Exit Generation is “a raucous, frenetic dose of sci-fi insanity with some genuine emotion at its core” & gave it 4/5; you can see his thoughts HERE. On Nerdly, Dean Fuller called it “a comic with a good premise, a well developed back story, and a group of characters that will develop as the plot progresses” – Thanks! See the rest of the review HERE. Paul Mirek of Broken Frontier observed “a kinetic energy to this first issue that should be familiar to anyone who’s ever turned their headphones up loud to escape from reality, mundane or otherwise”, & reviewed the issue HERE, while recommending it as a pick-of-the-week HERE. Pop Culture Uncovered‘s John Amenta awarded the issue “5 Expendables DVDs of 5” & said Exit Generation #1 “is the best kind of first issue a reader could hope for” – Awesome! See the full article HERE. Brad Gischia over on Bag & Bored said this series is “one that you should be keeping your eye on” – See the rest of the review HERE. Josh On Comics called Exit Generation #1 “a charming little read, from start to finish, with superb, expressive artwork to boot” – Thanks, Josh! You can read the full review HERE. You can see Nerdover talk about Exit Generation on their show this week HERE. The team at House To Astonish gave a really positive review of the book on their show this week; give it a listen HERE. On Meltdown Comics‘ Meltcast, Exit Generation #1 was a pick of the week; thanks so much, guys! Hear their thoughts HERE. The folks on the Awesome Comics Podcast also enjoyed the book; give a listen to this weeks show HERE. Wow! That’s a LOT of mentions! Both the team & myself are really grateful for all the attention people have given the book, & I hope that if you’ve not yet picked it up, some of the nice things said about it from the people above might persuade you! So, pop on down to your local comic store, or dive into Comixology (HERE, if you’re looking) & take a peek! Till next time; take care! As I type this it is only a few days until the Final Cut Off date for retailers to order ‘Exit Generation’ #1, which falls on Friday 18 July. But even though the deadline is drawing near, there is still time to get your order in! If you’re at your local store this Wednesday for your new comics, you can ask them to order a copy using Diamond Code JUL151204 – & you can still see a preview of the first issue (along with a bunch of other details) right HERE. Across the past month both ComixTribe & myself have reached out to hundreds of retailers all across the world to talk to them about the book, & I wanted to put on record my gratitude to all of those stores who’ve already shown their support, & of course a huge “Thank You!” to every single person who has shared information about the book on social media, talked with their friends about it, or even just taken a look – it truly means a great deal to the team & I. From the brilliant Zak Simmonds-Hurn comes this stunning piece featuring Hanna & Scrap, two of ‘Exit Generation‘s intrepid gang who we meet in issue #2! Zak is a UK-based comic artist, with work regularly appearing in a number of publications, including The Phoenix for whom he draws the ace comic ‘Sky Drifters’. You can (& should!) go check out Zak’s website HERE, & make sure you take a peek at his self-penned comic Monstrosity too; you won’t regret it! From the mega-talented Alex Cormack, my partner-in-crime on ‘Find‘, comes this tremendous piece showcasing ‘Exit Generation‘s punk music-obsessed, action-movie loving ‘front man’ Jack! Alex is as prolific as he is skilled, & will soon be exploding back on to comic store shelves once again with ComixTribe‘s new series ‘Oxymoron: The Loveliest Nightmare‘, so make sure you check that out, & also catch up with all Alex’s art over on his website. Michael Kennedy – The Gang! This phenomenal pin-up of the gang tangling with the fiendish Ruleians comes from the mind of Michael Kennedy; a frighteningly talented gent who needs to be on every single one of your radars immediately! Currently working on upcoming creator-owned series ‘Spiritus‘ & with a website chock-a-block with eye-popping art (check it HERE), Michael is for my money one of the hottest new British creators around right now; get over & have a gander at his stuff! With pencils & inks from the most-excellent Ruairí Coleman, & beautiful colours by Timothy Brown, here we see best buds Mo & Jack heading into battle against the alien menace! Ruairí has worked for a number of publishers, including on ‘Turok: Dinosaur Hunter’ for Dynamite & covers for IDW‘s ‘TMNT Amazing Adventures’, & his Instagram (which you can find HERE) is a treasure trove of spectacular art, while you can also see more of Tim’s gorgeous colours on his DeviantArt page HERE; go take a peek at both! Behind this delicious (pun fully intended) pin-up of the Ruleian boss-man The Chief Taster is the superlative pairing of Jason Copland on inks, & Dee Cunniffe on colours. Jason is co-creator of recent series ‘POP’, art mastermind behind ‘Kill All Monsters’ (which is in ‘Dark Horse Presents’ today; go grab it!) & will be working on Marvel‘s just-announced ‘What If: Infinity‘ mini-series later this year. You can find his work, original art & other info on his site HERE. Dee works on top titles such as ‘Wicked+Divine‘, ‘ODY-C‘, ‘Granuaile: Queen of Storms’ & ‘MayDay’, as well as many more, & you can see more of his luscious colours over on his ace blog HERE. Well… Let me be the first to say WOW! So, so grateful for the time, skill & talent all of the creators above invested in these pieces, & could not be more delighted with them. Make sure you go follow every single one of them on Twitter, Tumblr, Instagram, & every other platform they might be on, & make sure to go buy all their books & art! After all that excitement there isn’t much more for me to say other that I hope you all enjoyed the beautiful art, please consider ordering ‘Exit Generation‘ #1 this week (Diamond Code JUL151204 – see a preview HERE) & thanks again for popping by! Last summer I wrote a blog (which you can read HERE) about how important my time as part of a community of like-minded & mutually supportive comic-making folks in Glasgow had been to my development as a creator. What had prompted this reflection was seeing several friends of rising stature in Scottish (& worldwide) comics being recognised at Glasgow Comic Con. Their receiving richly deserved praise, attention & in certain cases awards to go with their hard work & talent was wonderful to see. At the time I said I aimed to be at the 2015 event, & being a man of my word, that is exactly where I’ll be this weekend! In fact, I’m honoured to have been given the chance to talk on a panel alongside several of my fellow Glasgow League of Writers (GLoW) alumni, all of whom are guests at this year’s convention. I’ll be alongside Garry Mac, Gary Chudleigh, John Lees, Colin Bell & Harry French on the ‘GLoW Goes Global’ panel, Sunday 5 July at 1415 in the Workshop Room which folks can find in the convention’s central hub at the Centre for Contemporary Arts. Be there, or be… well, you know. We’ll be talking about how we’ve all found our way in comics, since starting out all swapping scripts & providing feedback on each others nascent efforts back in a lil’ room in Hope Street Studios, what this taught us, & what we’re ail doing now. Hope you’ll pop over & take a look, & give us a listen. I cannot recommend the convention enough, & if you’re in town you should definitely head over. There are a bunch of ace guests such as David Hine, Shaky Kane, Al Ewing, Karrie Fransman, Mark Millar & a tonne of other ace folks, along with all sorts of events & activities spread across two days & three venues. If you click on the above image, it’ll take you to a version that you can print out & hand to your local retailer to have them reserve you a copy – share it around! Hope to see some of you at the con this weekend, and until next time; take care!